Concert pianist Simonetta Sommaruga has been playing the political keyboard virtuoso for years. As President of the Swiss Confederation in 2015, the head of the Federal Department of Justice and Police is responsible for some of the most contentious issues. September 2013: The Swiss Social Democratic Party (SP) was celebrating its 125th anniversary with a huge public celebration in Berne’s historic centre. The news spread through the crowd like wildfire – in a few minutes there would be a surprise event at the nearby “Progr” cultural centre. The hall was packed to the rafters, and there was a great sense of anticipation amongst the crowd. The two SP Federal Councillors, Minister of Justice Simonetta Sommaruga and Minister of Home Affairs Alain Berset, stepped onto the stage, sat down at the piano and delighted the audience with their piano duet. Sommaruga was wearing a long, black evening dress and Berset a black tuxedo with a bow tie. It was a spectacle that you would have expected to see in a bourgeois classical concert hall rather than at a public celebration held by the Social Democrats. A trained pianist, Sommaruga does not suffer stage fright. With her understated and elegant appearance, she even appeals to representatives of the most conservative factions. This gave her a decisive advantage over her rival Jacqueline Fehr, the SP National Councillor from Zurich, in the vote to replace the retiring SP Federal Councillor Moritz Leuenberger in September 2010. The allocation of departments provided a bumpier ride than the election. The fact that Simonetta Sommaruga had to take over the Federal Department of Justice and Police (FDJP) against her wishes and the wishes of her party sparked a sharply worded protest from SP President Christian Levrat. It was clear even then that few plaudits could be won at the FDJP, which is a political minefield. Sommaruga not only bears responsibility for several popular initiatives approved by the Swiss people with complex implementation problems, but also for the emotive issues of asylum and immigration policy. While the implementation of the SVP initiative against mass immigration adopted in February 2014 is a Herculean task in itself, the Federal Councillor is also driving forward the restructuring of the refugee system at a brisk pace. The dispatch on major asylum reform was submitted to Parliament in September. The main objective is much faster procedures. To achieve this goal, six large-scale federal asylum centres will be built. The search for sites, which was due to be completed by the end of last year, is proving difficult. The new Swiss President nevertheless seems to be spurred on by challenges. The minister shows no sign of emotion or anxiety, even in the most testing moments. She always appears cool and composed and exudes a calm of deep concentration and focus. Even during heated public debates, she does not betray any more emotion than an almost undetectable slight twitch of the facial muscles. And even though she occasionally speaks very frankly, she always maintains a rather detached friendliness. The new Swiss President is the ideal exponent of the art of networking, who attempts to engage all parties in the decision-making process and persistently endeavours to reach a compromise. When she suffers setbacks, she conducts herself like a model pupil, or perhaps a musician tirelessly striving for perfection. She starts afresh, reflects on the issue again and tries a new approach. She still plays the piano regularly but has not performed as a pianist for some time. 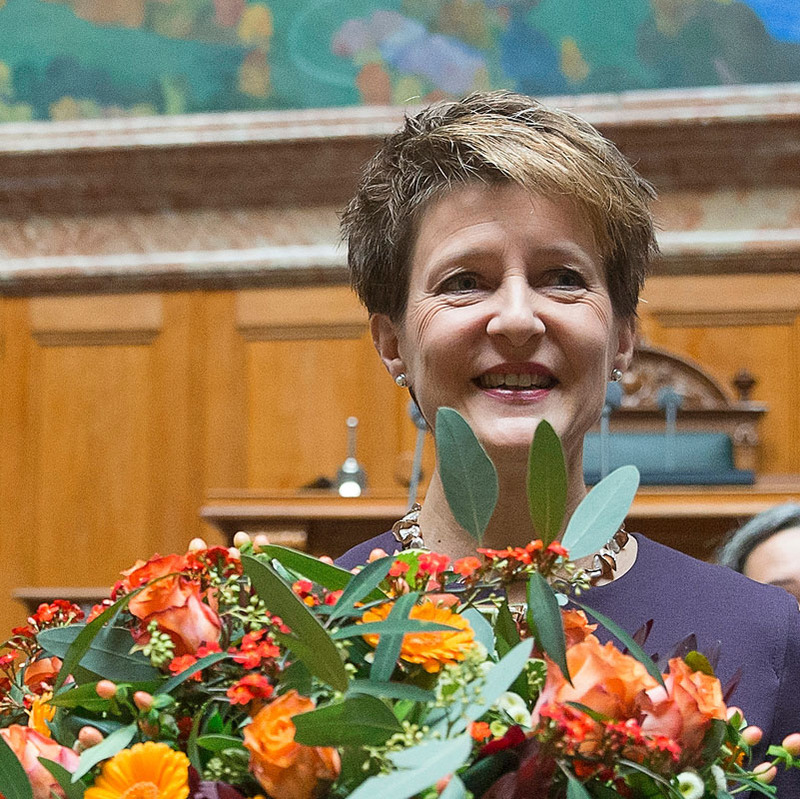 During her career, Sommaruga for a long time held the position of chief executive and then president of the Swiss Consumer Protection Foundation, which made her a well-known and popular figure with large sections of the public. She gained experience on the executive in the commune of Köniz, a suburb of Berne, from 1997 to 2005, and also held a seat on the National Council from 1999. In 2003, thanks to her popularity, she won one of the two Council of States seats in the canton of Berne for the SP. With the exception of a short period in the 1950s, these seats had always been held by conservatives. The 54-year-old politician, who grew up in the canton of Aargau and is married to the author Lukas Hartmann, is no slave to the party. On the contrary, as the co-author of the so-called Gurten manifesto in 2001, she was long regarded as a rebel within the party. The left-wing, liberal document questioned various traditional social democratic principles and said that the SP’s voter base was in the centre rather than on the left. This infuriated prominent colleagues and the party establishment who saw this as “neo-liberal pandering” to the conservatives. Sommaruga was treated with disdain in some circles. However, the SP was obviously unable to overlook her popularity and cleverly took advantage of it. What has remained nevertheless is Simonetta Sommaruga’s reputation as an independently-minded politician.